Jamie Webber, Senior Technical Events Officer at Medway Council, says this year will see the 5th Medway River Festival taking place on Chatham Waterfront. It is hoped that this year’s festival can work in conjunction with other like-minded events that are potentially taking place within the Medway area to bring them all under one umbrella. For 2016 as well as expanding the have-a-go water based actives on the River Medway we would also like to increase the number of activities, stands and demonstrations that take place on the land. These activities will better explain to visitors what takes place on the river and provide the public with information and tasters on how they can get involved in water activities themselves. This year’s River Festival will be taking place Saturday 9 July 11.30hrs till 17.30hrs and can welcome up to 6000 people throughout the day with the land footprint starting at Sun Pier and finishing at the Cannon Green at Gun Wharf. As well as having the stands and demonstrations we shall also be having themed entertainment, walk-about entertainers, children’s activities, a small children’s fun fair, picnic area and much more. If you are interested in attending the River Festival as part of the land based activities please complete the attached form and return to Ciara Lang, Medway Council, Gun Wharf, Dock Road, Chatham, ME4 4TR. The MSBA committee is looking for a volunteer to take over as Trophy Secretary from Ken Waller who has had to step down after many years service. As we currently do not organise a regatta, the main need is safe storage for the trophies. UPDATE: Wil Pretty has kindly volunteerd to take on this role. An organisation has made a request to operate a private seaplane within Medway Ports. The Port of Sheerness Ltd, as the Statutory Harbour Authority, is required to regulate and manage all types of operations within the Medway and Swale and therefore has produced a consultation document (or here) on this matter, which is available on the Peel Ports website for a period of one month. “Below is the reply that I put together for people that have made comments. “We have had considerable feed back about this matter, and it seems that I have perhaps not laid out the situation clearly in my notice. “We are not proposing any new operation, seaplanes have operated from the Medway almost since the invention of flight. This particular seaplane, which is a private aircraft used for leisure, is one of only 5 seaplanes registered in the whole of the UK. “The aircraft in question has been operating on the Medway for at least the last three years without incident or indeed comment from anybody. As the port authority we are obliged to keep the port open for anybody who wants to make use of the waters, provided there are no safety or legal concerns. There is no question of us either ‘allowing’ or ‘licencing’ this operation. We only have power to regulate it. 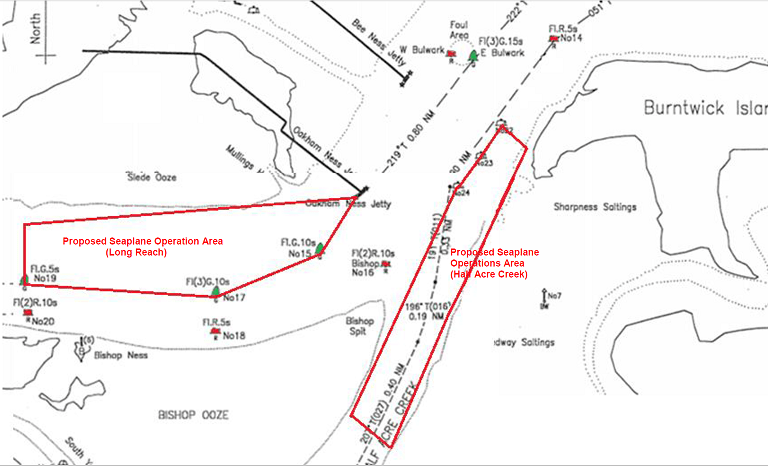 This consultation is merely about putting a restriction on where the aircraft can operate so that water users can be aware of where there is the small possibility that they may encounter a seaplane. For your information, there is no requirement for a surface vessel to give way to a seaplane that is landing or taking off. The legal obligation is on the aircraft commander to ensure that his landing area is clear and it is safe for him to land there.